Clarkson, who won the “American Idol” competition in 2002 and went on to a very successful career as a pop star, purchased the Austen ring for over £152,450 at a Sotheby’s auction in London last July. (Note: the sales price was more than five times Sotheby’s estimate). The simple gold ring set with turquoise is one of three surviving pieces of Austen’s jewelry. Vaizey’s temporary export ban will extend to September 30, with the possibility of a further extension to the end of the year if there is a proof of a serious attempt by a collector or institution to raise the appropriate funds to buy the ring. If purchased by a private collector, the ring must be leant to a public institution for exhibition 100 days out of each year. What do you think? Is Austen’s ring of significant cultural value? Would it be a loss to the nation? Clarkson, who won the "American Idol" competition in 2002 and went on to a very successful career as a pop star, purchased the Austen ring for over £152,450 at a Sotheby's auction in London last July. (Note: the sales price was more than five times Sotheby's estimate). 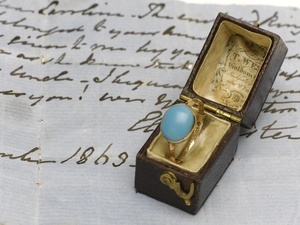 The simple gold ring set with turquoise is one of three surviving pieces of Austen's jewelry. Vaizey said in a public statement, "Jane Austen's modest lifestyle and early death [at age 41] mean that objects associated with her of any kind are extremely rare. So I hope that a UK buyer comes forward so this simple but elegant ring can be saved for the nation." Vaizey's temporary export ban will extend to September 30, with the possibility of a further extension to the end of the year if there is a proof of a serious attempt by a collector or institution to raise the appropriate funds to buy the ring. If purchased by a private collector, the ring must be leant to a public institution for exhibition 100 days out of each year. What do you think? Is Austen's ring of significant cultural value? Would it be a loss to the nation?